Baroque Seed Beads - Bello Modo - Your Online Source for Beads, Seed Beads, Swarovski Crystal, Findings, Tools and So Much More! 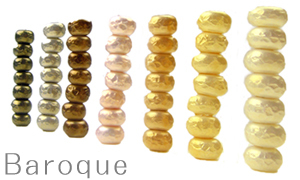 MIYUKI launched these new beads with a coating called "Baroque". It is similar to a pearl's coating, but the surface of "Baroque" coating is very unique texture. It is crepy and rugged texture which reflects the light softly and it suits perfectly to the elegant accessories.